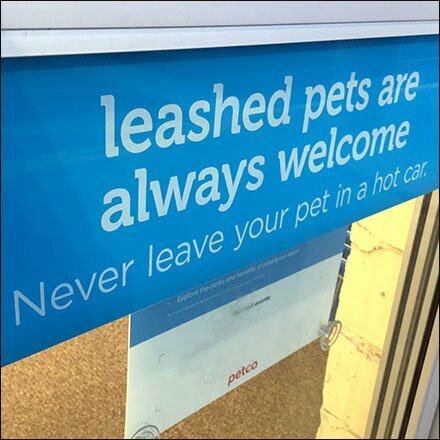 One might consider emphasizing the Never Leave Your Pet In A Hot Car Warning rather than the leashed pet limitation. A sealed car can reach 140º Fahrenheit. Not a healthy climate for pet of man. So don’t take any chances. Just remember to keep a leash in the car for occasions just like this. This Never Leave Your Pet In A Hot Car Warning seen very appropriately at Petco.